CBT is your supplier of top-quality, long-lasting machinery. 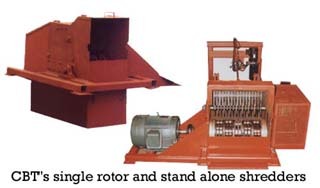 The main hammermill rotor for the pulverizer takes its power directly from the output shaft of the power unit. This ensures that full power is available at the hammermill rotor at all times. We do not power the main rotor with hydraulic power, because the response time under load is too slow and the power obtained is too weak for heavy duty grinding in heavy soils. Our infeed and exit conveyors are hydraulically powered and are, therefore, adjustable according to the moisture content of your dirt. We also power the upper rotor hydraulically and have the option to power the screen basket either mechanically or hydraulically. These features allow you to adjust to daily changes in conditions and work materials that otherwise would have to be let go for another day. Additionally, our shredder chamber is made from ½" thick armor plate steel. The original Lindig machines had ¼" mild steel. The components in the hammermill assembly and the upper rotors are made from very high hardness and very wear resistant materials and are more durable than the conventional steels of other manufacturers. Structurally, the fabrication of the rest of the machine is heavier and more durable than most other machines on the market. We are using ½" wall 6" x 4" tubing for the frame; C10 15.3 lbs/ft² for the exit conveyor channel; 12 ga sheet and 2" square x ¼" wall tube for the sheet and framing of the feed hopper. Virtually every aspect of this line of machinery has been made to last. And these standards we know to be higher than any other maker of this kind of machinery. We are proud of our attention to quality and want you to be exceptionally pleased with purchase of one of our machines. The lowest hammermill spins at high speed. The upper rotor (star whell) rotates at slow speed. The hammers of the lower hammermill rotor pass between the spaces of the upper rotor stars. 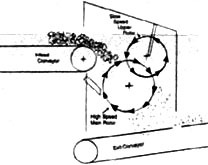 The lower rotor hammers hit the feed material and slam it against the upper rotor with such force that they pulverize, blast, shatter, shred, shear, tear, rip and otherwise destroy the feed material. The Soil Pro dual rotor design is very efficient and will make pulverized product out of even wet infeed materials. The power of the Soil Pro dual rotor shredding chamber is tremendous -- capable of handling dirt, soils, compost, even light rock, asphalt and other difficult materials with ease, and the through-put capacity is very high. The feed rate of infeed material can be substantially higher than other machines. And the efficiency of the grind will be 95-98% The amount of reject or or oversize material will be very minimal. The finished product will be pulverized to a well ground product. 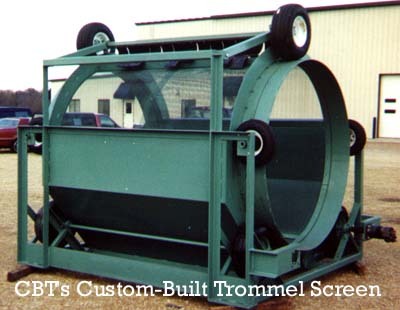 Since the Soil Pro shredding chamber has no screens surrounding the mill assembly and the delivery of the feed material is rated relative to the capabilities of the dual rotor system, the throughput of the system is very high and the wear life of the parts is exceptionally long. At production rates of up to 250 yards/hr one can expect a set of wear parts to process 10,000 yards of heavy soil and even 20,000 yards of peat or compost. The wear parts of the machine change with ease and will provide many, many tons of finished product between changes. Once pulverized, the product screens at a faster rate, with greater ease, and with a highter percentage of sale product than any simple trommel or deck screen. This is the best, most efficient, most powerful, most productive, and most economical machine on the market today. 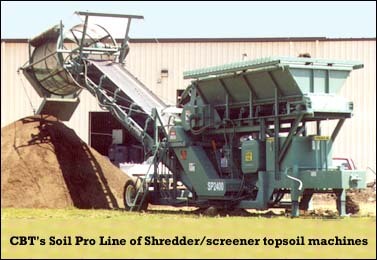 Call today for more information on how a Soil Pro shredder/screener can put more product out for your customers and more money in your pocket. (c) 2002 CBT Wear Parts, Inc., Richland Center, WI; All rights reserved. Our machinery is custom made to your design requirements. Side discharge stacking conveyor for finished product. The power of the Soil Pro dual rotor shredding chamber is tremendous -- capable of handling dirt, heavy soils, compost, and other difficult materials with ease, and the through-put capacity is very high. The feed rate of infeed material can be substantially higher than other machines. And the efficiency of the grind will be 95-98% with minimal reject or oversized material. The finished product will be pulverized to well-ground product. Once pulverized, the product screens at a faster rate, with greater ease, and with a higher percentage of sale product than any simple screen system.